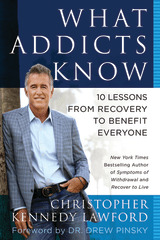 In "What Addicts Know," Christopher Kennedy Lawford revisits the topic of addiction and provides an eye-opening explanation as to how our culture has become dependent on the instant gratification of gambling, drugs, alcohol, technology, and material possessions. Here's an excerpt. I've dealt with a wide variety of individuals afflicted with the disease of addiction, and in my estimation they are the most interesting, fascinating, and gifted people I've come across. They are also the most challenging; addicts are deviously manipulative and self-absorbed. Their illness causes suffering and pain for themselves, their loved ones, and the rest of society. Yet from their struggle comes an opportunity for all. Recovery is about exposing and healing the darker sides of being human. And honing the skills necessary for sustained recovery from addiction reveals a life-enhancing recipe that can benefit everyone. From the darkness come exquisite, profound gifts. People who get punched in the face by the 800-pound gorilla of addiction for decades and who live to tell about it are remarkable human beings on many levels. They are not just survivors, they are teachers. And it’s time we all pay closer attention to what they have to teach us about human well-being. Whether or not you are or have ever been an addict, whether or not you know addicts—in fact, even if you consider yourself hopelessly normal and not prone to any kind of addiction or seriously bad habits—you are still at risk and will benefit from the advice in these pages. Before you snicker with skepticism or indignation, let me tell you why I think this is true. As a culture we've become addicted not only to gambling, drugs, alcohol, and the other usual suspects, but also to technology and the acquisition of material possessions and every conceivable promise of instant gratification. More is better has become society’s mantra. We eat more, spend more, take more risks, abuse more substances...only to feel more depressed, unsatisfied, discontented, and unhappy. You may know these symptoms firsthand, or recognize them in the lives of the people you care about. What we are left with is the throbbing emptiness that sets in when the fixation on more brings us nothing but more of the same old feeling of want. As a consequence, most of us will do or try just about anything to escape the recurrent stress, frustration, discomfort, and boredom. Those are the warning signs on the road leading to the cliff of addiction and social dysfunction. --17 million alcoholics --19.9 million drug abusers --4 million with eating disorders --10 million problem gamblers --12 million with sexual compulsions --43 million cigarette smokers. To complete the picture we must add in those who also admit to being in recovery from an addiction. At least 10 percent of U.S. adults aged 18 and older are recovering from drug and alcohol abuse. Add in those folks recovering from sexual compulsions, gambling addiction, smoking, and food-related issues, and we’re probably talking about one in five of all adults, maybe even one in four. These disturbing statistics are true for just about every industrialized nation. Has addiction become the new normal? I don’t know, but we do seem to have become a world of addicts. The toxic compulsions affecting so many people in North America can be found spreading like a metastatic cancer to practically every culture on earth. To repeat, it’s not a crisis of moral weakness and lax discipline. It’s a brain disease. Medical science has now conclusively proven that. Having this disease doesn't necessarily mean the end of your quality of life. As the history of drug and alcohol treatment and recovery demonstrates, people can and do recover— and do so magnificently—emerging from the ordeal far stronger and better prepared for life’s many and varied challenges. How they did it offers a recovery plan for humanity itself, a plan laid out in the ten lessons in these pages. Am I generally content with the way things are? Are my emotions mostly on an even keel? Are my personal relationships strong and supportive? Is there enough joy in my life? Your answers may lead to a realization that what you need is recovery—a recovery that is unique, personal, and crucial for you. Because recovery is about finding something we've lost, and what we have lost is our true self. Alienation from self is a byproduct of this culture of ours and its fixations, and we are all trying to find ourselves—whether we realize it or not. Addicts in recovery have discovered a process for achieving just that. These pages give you the practical tools mastered and lived every day by those countless people who have successfully stayed in recovery. It may take some time to get off the Ferris wheel of repeating your mistakes over and over, but if you’re going to be compulsive about something, you can’t do much better than relentlessly pursuing a healthy lifestyle. So consider this book a gift from the recovery community to all of humanity. Most of society continues to accept us addicts only reluctantly, not yet knowing what we have to give back. But what you now hold in your hands could, hopefully, change all that. He wrote the New York Times bestselling memoir, "Symptoms of Withdrawal" chronicling his deep descent into near-fatal drug and alcohol addiction, and his subsequent hard-won journey back to sobriety, which he has maintained for the past 26 years. Mr. Lawford wrote "Moments of Clarity: Voices From the Front Lines of Addiction and Recovery" and his newest book, "Recover to Live: Kick Any Habit, Manage Any Addiction".